You are at a concert or festival and you really have to… pee. Our participant in Experience Economy & Tourism; PeeFence delivers a portable, cost-efficient and lightweight solution to solve that challenge. The team behind PeeFence entered the Next Step Challenge program with a purpose, taking their business plan and strategy to a new level in close collaboration with their advisory board and the team behind the accelerator program. Entering a program like Next Step Challenge is about challenging your beliefs and testing the hypothesis you made. It is easy to get stock in one track, but maybe you actually need to stop up and reconsider everything and get another perspective on your entire business, says Frederik C. V. Hansen, Partner & CO-Founder of Peefence. See the video below. Put an end to the stench and incorporate PeeFence in your event gear. The flexible event urinal is easy to mount, and as a bonus you can even add commercialization to the product. Your event guests spend their time in front of the fence anyways, so why not add a commercial to the mix. Having ads direcly on the urinal is highly effective. With PeeFence your guests can pass water without being a nuisance to the surroundings. Winner of a Danish Design Award in 2016 – and nominated this year! 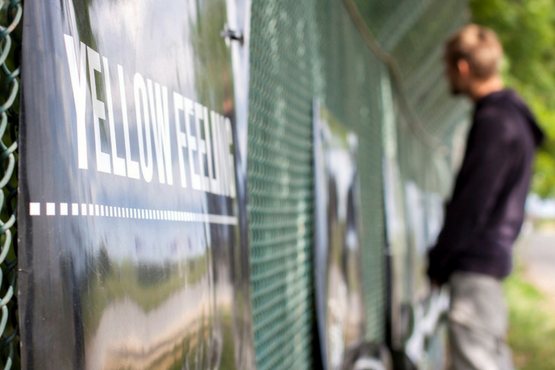 PeeFence is a flexible urinal which is easily set up in great quantities at outdoor events. The urinal is made from a tough, hygienic and light weight plastic membrane which is foldable for efficient transport and effortless setup. It is a quite simple aim, yet a complex task; finding the right business model. Working closely with the team and our advisory board, we are getting closer to finding the key. That specific sales strategy and way of sending PeeFence out into the market, is the main area where we’ve picked up extremely qualified sparring in the program, explains the team.